February | 2010 | takilya ni leaflens - dakilang #filmmiron ever! You know Hollywood’s in trouble when you see super-great thespians like Ashley Judd, Billy Crystal and Julie Andrews in a film with an obvious “comedy blockbuster” pitch. Is there a lack of projects for these people that they have to settle for roles like these in a film like this, a film I would put in my self-created category of “pang-DVD/dibidi moda lamang” (for DVD mode only), meaning I won’t really spend much money watching this kind of film in a theater, where I would normally spend like 150 pesos (US$3) plus another 150 pesos for popcorn and drinks (total US$6) plus travel expenses, and instead watch this when it comes out on DVD (in my neighborhood rental stores or my friendly neighborhood optical media pirate). That is how I gauge films. With the cost of living expenses not getting better in Manila, I’d rather spend my hard-earned money on films that are worth watching on the big screen. Sadly, this ain’t one of that. But I have to admit, the super-thin linear plot of the film somehow works with the kind of concept it has. Imagine learning the tricks of the trade of fantasy characters like the tooth fairy, a fantasy character that North Americans believe in much like Santa Claus. 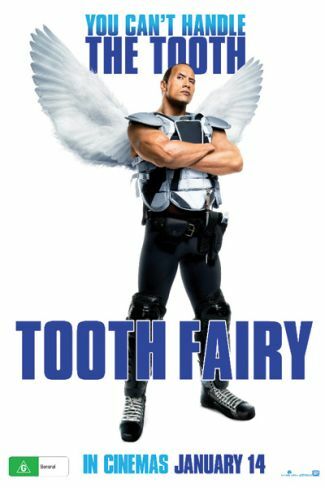 Here in the Philippines, we don’t have a counterpart for the tooth fairy, and I’ve never heard of someone doing that “hide the fallen tooth under the pillow for money” thing in any way, ever. So this foreign mythology still remains foreign to us, and therefore a film about this mythology remains merely as a, well, simple film with a cute storyline. That’s all. But the cuteness of it worked for me somewhat, if not for the great thespians that I originally pitied at the beginning upon seeing them here. On the other hand, if they were not here, this film would not have that pizazz that I bought hook, line and sinker. 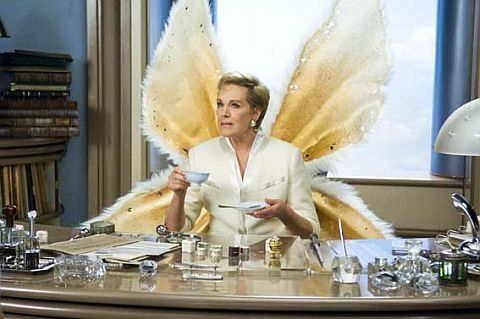 I mean, imagine Mary Poppins or Maria Von Trapp playing a freaking tooth fairy godmother!!! Yes, complete with British accent and all. And what about WHEN HARRY MET SALLY’s Harry, who brilliantly played the eccentric tooth fairy gadgets master here, in his usually brilliant comic way. Man, I wish Billy Crystal would go back to hosting awards shows like the Grammys or the Oscars. Aside from Whoopi Goldberg and Ellen Degeneres, no one else should host such awards. Sila lang! But I digress. maria von trapp... with wings! And then there’s Ashley Judd, who already cut her teeth doing dramatic roles, and whom I always mistake for Charlize Theron hehe. But she could hold her own. I distinctly remember her as the emotionally conflicted wife of bisexual Cole Porter in his bioflick DE-LOVELY. Love the soundtrack of that one. I’ve always been a Cole Porter fan kasi, but I digress. I don’t like it that Ashley seems to be the only one who doesn’t have a character with a unique twist, or some sort of thespian challenge of sorts. Heck, even a former wrestler could have such a major twist for his character, why not her? She ended up as the mother of the kids, the girlfriend of the protagonist, and that’s it. Oh man, any Hollywood doozie could play that!!! Why her??? Oh well. With news that Miramax is shutting down and all that, and then I see this, oh no, is Hollywood on red alert na? Maybe blue alert. Or orange? Ewan. Ewan ko lang ha, but when Sandra Bullock starts winning acting awards for films that really didn’t demand much of an acting stretch from her, Hollywood, again, is in trouble. I mean, can’t we not see that the botox is preventing her from acting at all!!! Nubah! This is so obvious doon pa lang sa THE PROPOSAL anubeh! Bring back the Sandra facial expressions I so sorely love and miss sa DEMOLITION MAN, and the super-hilarious MISS CONGENIALITY, WHILE YOU WERE SLEEPING and of course sa SPEED. Kalurkey. I’ve read somewhere that she was even being compared to Julia Roberts’ ERIN BROCKOVICH performance and win, which they say are kinda parallel to this film. But with that one, you could see where Julia’s Julia-ness and Erin’s character meshed and gelled together very well, like how sodium would blend well with chloride to produce salt hehe or some kinda chemical compound thing like that. You know what I mean. Sadly, as much as I like Sandra’s cuteness over the decades, I so do not support this win. I hope she finds another material and I certainly hope she lays off the botox first, to get a more deserved win. But on the up side, I admire the real-life people behind this story. Times like these, with bad news and all, all over the world and beyond, it’s so nice to see that there are still some people who are good and kindhearted like the family portrayed here. The family supported the story well, acting-wise, and of course the guy who played Big Mike, the impoverished black kid who became a football star. It’s just scary to realize that, in the time of Obama-ness, there are still some parts of America that wish ill for the black folks. So sad, and really so scary, come to think of it. I so do not want to go to such areas, so I’ll stick with traveling to multi-cultural places like the two coasts, thank you very much. Okay na ako doon.